This article is dedicated to analyzing the best public and private educational establishments for studying Chinese in Guilin and Yangshuo, two incredible places to live in the Guangxi province. In addition, we will analyze the pros and cons of studying Chinese in these two places. Mandarin is quite extensive: Given that they are important tourist destinations, both Guilin and Yangshuo are home to people from different parts of the country, which means that Mandarin is quite commonly used. In addition, the local dialect belongs to the southwestern branch of Mandarin, which is characterized by not having the retroflex consonants (zh, ch, sh, r) that standard Mandarin has. Despite the fact that the dialects of Guilin and Yangshuo can sometimes be incomprehensible for standard Mandarin speakers, they continue to be dialects that are a lot closer than those in the country’s southeast, such as Guangdong or Shanghai dialect. The cost of living is low: The cost of living in Guilin and Yangshuo is quite a bit less than in large coastal cities, between 20 and 50% less. Even so, you have to avoid the touristy areas, which can be a bit more expensive. Pleasant climate: Guilin and Yangshuo tend to have quite a pleasant climate throughout the year, with mild winters (normally above 10°C) and summers that aren’t too hot (they don’t tend to go over 30°C). Still, summer can be a bit humid and can rain quite a bit, and strong winter winds can be somewhat uncomfortable. Relatively low pollution levels: The Guangxi province is far from the main manufacturing centers, which means that there is quite a bit less pollution than in the main cities. 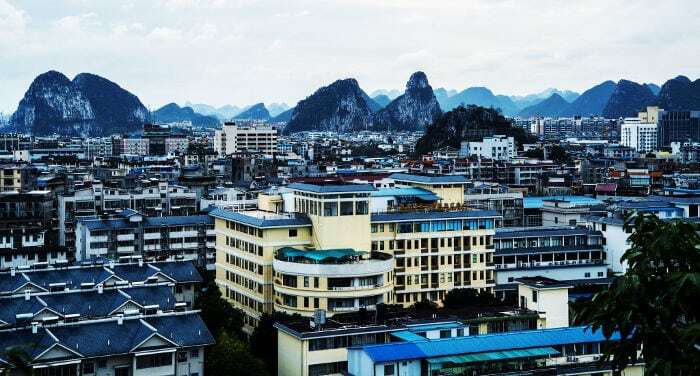 Relatively international: Being an important tourist destination and a pleasant place to live has made it so that both Guilin and Yangshuo have a large international community, and much better services for foreigners than in other similar-sized Chinese cities. Far from economic centers: If your goal is first to learn Chinese to then later try to get a job or contacts to start a business, maybe Guilin and Yangshuo aren’t the best places for studying Chinese, as the province continues to be relatively poor and the opportunities are still negligible compared to other places in the country. The only exception to this might be the tourism sector. Touristy city: Guilin and to a lesser extent Yangshuo are cities that attract a large number of tourists during the year, especially during the most important festivities of the year. This can be a problem due to the collapse of local infrastructure and services. The Chinese Language Institute (CLI) is a prestigious culture and language center located in the city of Guilin and the only language school affiliated with a university in the Guangxi province, Guangxi Normal University. CLI is ideal for language students, university students seeking credits or groups looking for a personalized experience in China. Their immersion program is undoubtedly one of the most efficient ways to master Mandarin through one-on-one training, constant interaction with the language and cultural immersion. In addition, CLI also offers the College Study Abroad program for university students seeking a relevant international experience, enjoying a variety of excursions and attending English-taught courses on Chinese economy, politics and the humanities. With strong connections at private and public institutions throughout the country, the Chinese Language Institute opens China up to its students in countless ways. Omeida Chinese Academy offers high-quality Chinese language courses in one of the most breathtaking towns in China: Yangshuo. Whether you’re looking for intensive immersion, standard load, or part-time language lessons, Omeida is guaranteed to meet your needs. Course prices are available for calculation on their website. Language Partners: Omeida Chinese Academy is a joint school with Omeida’s English College just next door. You will be given a native Chinese language partner to practice your Chinese with. Mandarin students live, eat, and hang out with students from the English college, creating a natural language environment. Volunteer Program: Students who volunteer with Omeida receive free food and accommodation as well as a discounted rate on their tuition. Environment: Clean air and incredible, mountainous scenery help many foreigners quickly fall in love with Yangshuo. Students often spend their afternoons biking through the countryside, taking Tai Chi classes, river rafting, and rock climbing among many other activities. Guangxi Normal University (GXNU) was founded in 1932 and currently has around 30,000 students, 700 of which are foreigners. The university has three campuses (Wangcheng, Yucai and Yanshan), one of which is located in a historical building from the Ming Dynasty (700 years old). The GNXU offers different types of Chinese classes including both short and long-term ones, as well as group and individual classes. You can sign up for short classes all year long and they cost 200 Yuan per individual class and 600 Yuan for group classes per week or 2000 Yuan per month. For long-term classes for which you can apply for scholarships, you only have the possibility of signing up in June for year-long and six-month courses, and in December for six-month courses. The price is 6800 Yuan for the six-month course and 12,800 Yuan for the annual one. The Guangxi Normal University is affiliated with the private institution The Chinese Language Institute. Guilin University of Technology was founded in 1956 and has almost 30,000 students, including students from 30 different countries. The university has Chinese language courses. It is one of the city’s most prestigious schools for research, with a certain international prestige. It offers two types of programs to study Chinese: short 8-week classes that start in April and October, or annual classes that start in March or September.